We get stuck in food ruts. For some reason I don't quickly tire of the foods I like, so I have no problem making and eating the same few things over and over again. Maybe deriving happiness from this simplicity is a gift from the universe. That's how I'll choose to see it. 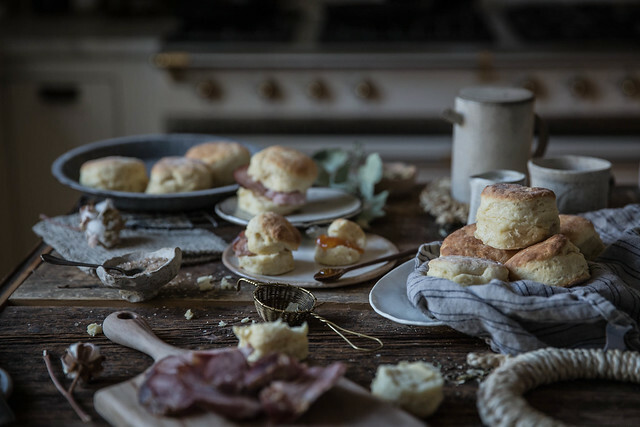 I've been making these fluffy, flaky, delicious biscuits nearly every weekend. And I recently learned that I can make superior buttermilk by adding lemon juice or vinegar to plain milk. This weekend's batch were the best yet. I serve them with whatever's in the kitchen already: butter, jams, za'atar, proscuitto, cheese. Add these to your rut. You'll smile. Additionally. Beth Kirby's photography blows me away.